Former Vice-President, Atiku Abubakar, made a practical return to the Peoples Democratic Party, PDP, yesterday, with a courtesy call on the national leadership of the party and called on former party members, who left the party with him, to return. Without referring to the ruling All Progressives Congress, APC, Atiku affirmed that no government had performed up to half of what the PDP achieved in its time in government. Among those who left the party with Atiku were Senate President Bukola Saraki, Transport Minister, Mr. Rotimi Amaechi; Senators Rabiu Kwankwanso, Danjuma Goje, Aliyu Wamakko, among others, now holding prominent positions in the All Progressives Congress, APC- led government. Atiku’s call was received with quiver among some of the former PDP chieftains, most of who preferred to be left out of the issue. The call came as the race for the national chairman of the PDP, yesterday, got on a knife-edge, with the leading aspirants sweeping across the states in a last-minute rush for delegates. As the leading candidates swept across the states, party chieftains including governors headed to Abuja for crucial caucus meetings expected to commence today on harmonising positions ahead of the convention. There were also indications that some of the party’s presidential hopefuls were also unwittingly gravitating towards one of the national chairmanship candidates (names withheld). On his part, the chairman of the PDP Convention Planning Committee, Governor Ifeanyi Okowa of Delta State, has assured that PDP governors would not force a national chairman on the party, contrary to insinuations in some circles. Prince Uche Secondus, one of the leading national chairmanship candidates, was headed to Abuja last night for the series of meetings commencing today, following a sweep through Taraba, Gombe and Benue States. Another leading candidate, Dr. Raymond Dokpesi after going to Ebonyi and Enugu, was last night, canvassing for delegates’ support in Abia with his delegation and is also expected in Abuja today for final consultations with party leaders. A high-level party source said, yesterday, that the meetings starting today among governors and other party senior officials would be directed towards streamlining the candidates for the various positions and notably, the office of national chairman. “If we are unable to harmonise, then we will go to the convention ground to determine the leadership, reflective of the PDP as a truly democratic party and not like the APC that has not been able to hold a convention,” the party source said. PDP presidential hopefuls, it was learnt, are also delicately engaging around the contests for positions in the new National Working Committee, NWC of the party. Atiku, whose bearing had been speculated to be towards Prof. Tunde Adeniran, and Prince Uche Secondus, absented himself from a scheduled meeting with Northern Elders on Monday night at Ibro Hotel, Abuja. The Northern elders, who had taken position against Secondus, waited for Atiku’s arrival for the scheduled meeting to no avail. Meanwhile, Atiku was, however, at the PDP national secretariat yesterday, during which he called on those who left the party to return home. Shortly after being handed the microphone, shouts of ‘Baba oyoyo’ rented the air as the former number two citizen had a difficult time trying to prevail on praise singers to spare him a few minutes to make his remarks. In the melee, a pickpocket made his way into the crowd but was quickly arresteed by a team of security operatives who promptly handcuffed and took him away. In a seven-minute speech, Atiku said he was at the PDP National Secretariat to ‘come and show face,’ having earlier announced his decision on social media a few days ago. “All that I have come to do today is to come and show my face. Many people have read in the media that I have returned home. This is the home. “Mr. Chairman, I want to congratulate you for a wonderful work which you have been doing to redeem the image of this party, to reform it, rebrand it and return it to its original form. “I want to assure you of my support and cooperation at all times, to make sure that these objectives are achieved by you and subsequently by your successors,” he said. He also called on those who left the party at one time or the other to return home without further delay. “Let me pay tribute to past leadership of this great party; where ever they may be and to call upon them to, please return home as I have done. It is only by their returning home that we will build a stronger, more united party that can again return to government and continue to deliver the dividends of democracy,” he said. He lauded the achievements of the PDP saying “I can bet you the records we have achieved so far in governance, no government has yet even done 50 per cent of what we have achieved in government, not to talk of equalling our performance in government. “We should remember that those of us who founded this party, founded it on the principles of democracy, good governance, unity of this country and the prosperity of its people. “Now that we have learnt our lessons, I hope that we will be guided by the lessons we have learnt. And that is to make sure that we build an all-inclusive party, where every part of this country will have a sense of belonging and sense of participation. “To achieve all these, there must be sacrifices, understanding, and compromises in the process of achieving that. And that is what I speak to members to imbibe. But as you know, one thing that I will never compromise is the internal democracy process in a given political party,” he assured. 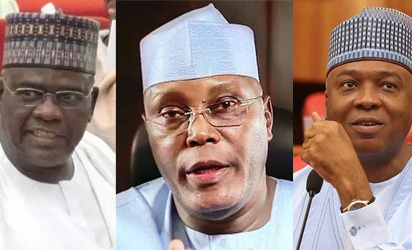 Responding, chairman of the National Caretaker Committee, Senator Ahmed Makarfi said with Atiku’s formal return to the party, more returnees were being expected. “Your Excellency, you have opened the flood gates, and we expect many more high profile returnees and new entrants into the PDP. So, PDP must be prepared for this, and be ready to reconcile and reintegrate in such a way and manner that everybody will be treated and given a level playing field to pursue his or her personal aspiration. “You have returned in good time, and you should continue to contribute in this reinvention, remodeling of our party so that come 2019, we can reclaim what we can claim is ours because we remain the only truly democratic party in the true sense of the word. “You will also help us reinvent the vehicle that will take us to Aso rock in 2019. We are not just targeting Aso Rock; we are targeting the federal legislature, the states, both the executive and legislature. We are targeting the local governments. “We want to sweep elections all across the party. As a united party, we have the capacity, and we have the ability to do so,” Makarfi said. Meanwhile, the chairman of the Convention Planning Committee, Governor Okowa has ruled out any reason for fear by the candidates that the governors would foist a national chairman on the party. Okowa spoke in a television interview on Channels Television monitored in Asaba. “In most of the states, the convention delegates are already known, and the party will ensure it gives a level playing ground to all the aspirants”, expressing hope that “the party will be more united, following its upcoming convention on December 9. “I believe that the National Caretaker Committee of the party is doing a lot to ensure that things are put in place, as for the national planning committee that I lead, we were inaugurated this afternoon, and we have held our inaugural meeting. On reports that the Chairman of the electoral panel and former Governor of Benue state, Mr. Gabriel Suswan had declared support for a candidate, Okowa said: “I’m not aware that he has declared support for any particular candidate, but even if he has any sentiments for anyone, he will not be in a position at all, on the convention day to do anything that is unjust. We are going to adopt the open secret ballot system of voting. “We believe that as many persons that come into the PDP are good for us because it will help to strengthen the party because politics is one that is inclusive; the more persons you get into the party, the greater the strength of the party. So we will welcome him into the party just as we will look forward to many more persons who will want to come over to join us as a family it will be a welcome idea because it will help to strengthen us going into 2019″. Meanwhile, Secondus one of the national chairmanship candidates has vowed that his chairmanship would be inclusive if he is elected on Saturday. “We will not engage in winners take all. All stakeholders will have a sense of belonging as we will enforce the party constitution. Please ignore those spreading fears and alarms about my candidature. “Those spreading rumours about what the party will look like under my leadership are mere blackmailers.I have occupied that chair before, and our records of glowing performance speak for us. We performed creditably in all capacities we have been opportune to serve,” the aspirant said. “I am a team player right from the beginning of my political career. Winning as a political party demands a team playing attitudes. I not only know this but I have practised it all along as a political leader. “Those spreading falsehood are scared of their shadows.I am running on my records as a leader with achievements to showcase.There is no doubt I am the best man for the PDP leadership,” the statement noted.